Place the beef in the pot with the onion, green pepper, garlic, salt, pepper, coriander or cilantro with enough water to cover it all. Let cook at low heat until the beef is soft, be careful to add water if necessary. Once the beef has softened, add the yams and let boil to allow the liquid to thicken, and then add the yautía, carrots and the plantain or banana. Let boil so allow the flavors to mix and to achieve the desired thickness. You can also add 1 large potato or corn on the cob. I put the seasoning through the food processor so that they aren't found in the soup, but you can leave them in bigger chunks if you prefer. 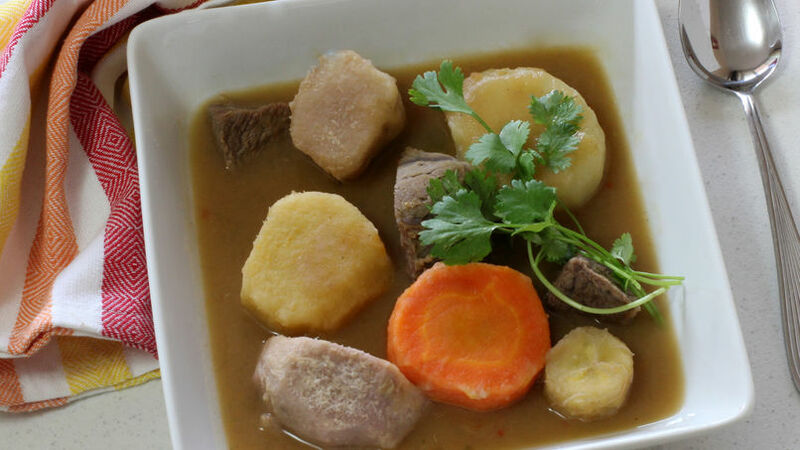 Panamanian sancocho is common in the central zone of the country. The ingredients include a variety of tubers and beef, chicken or pork. It’s served warm with white rice. The recipe also allows for the use of corn, yucca, yam and yautía (malanga). It's seasoned with onion, garlic, salt, pepper, coriander and ground oregano. When you use beef, as in this recipe, it becomes beef stew.